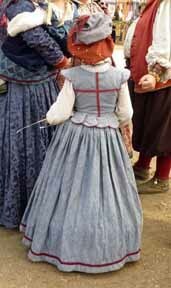 The 49th annual Southern California Renaissance Faire has just ended. 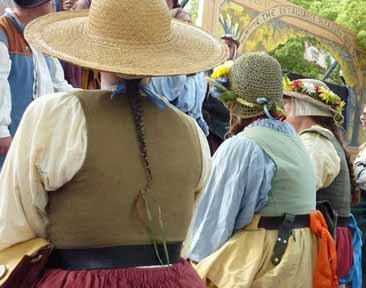 ﻿﻿The amazingly talented couple who started the faire in the 1960’s were Phyllis and Ron Patterson. Phyllis was a teacher and Ron an artist (he recently passed away). Authenticity was at the top of their list of priorities for the faire all the years they were in charge, sometimes to the chagrin of the artisans and participants, but as faire-goers we always appreciated the details and choices the Pattersons had made that enabled us to feel that when we parked our cars on the chamomile-scented hillside we were stepping back into the 16th century. Such immersion in what feels so like Elizabethan England is a joy for those of us who enjoy historical fiction (or non-fiction) or just like to step away from modern life. My sister and I have visited or worked there every year for more years than I choose to tell. It’s changed a lot since its early days in the oak covered Agoura hills. But in some ways it’s wonderfully the same, especially in the many friends we’ve made there: the crafts people and artists who really are the faire to us. 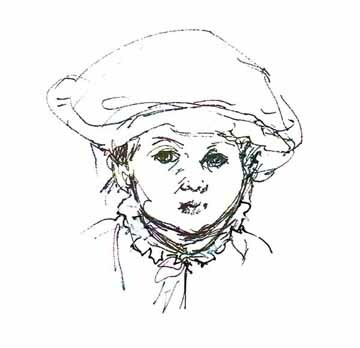 It has also always been a wonderful source of inspiration for me, as a writer, an illustrator and a painter. In such a setting there is, for an artist, an abundance of images to sketch or photograph for future reference, and this year I continued to supplement my large collection of reference views of costumes and accouterments, which in some cases are faithfully-reproduced examples of life in the 16th century. 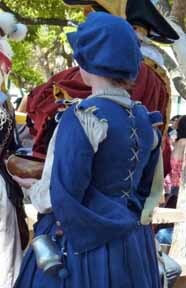 I took several photos of back views of costumes this year, as sometimes those costume references are not available. I’m currently working on illustrations for which all these years of joyful research are especially useful. Huzzah for the Renaissance Faire! I recently saw the new film version of Charlotte Bronte’s Jane Eyre and enjoyed seeing Jane hard at work on her sketches throughout the movie. 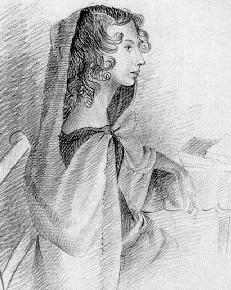 I was reminded that all the creative Bronte siblings—Emily, Anne, Branwell and Charlotte—drew and painted as well as writing stories and poetry. The girls would have studied drawing and painting as part of the ‘womanly virtues’ ladies of that period were expected to be competent at in order to be good wives or governesses. I researched that aspect of women’s lives when I was writing my book about a girl painter set in the same time period the Bronte girls were young. Girls’ paintings were genteel accomplishments. The instruction usually involved copying famous works of art. How many painters and illustrators have felt a similar discouragement at times? But how interesting it would be to see how Charlotte would have illustrated Jane Eyre! Apparently she had decided, however, that she did not have the originality to be a professional artist but could instead use her artist’s eye and imagination in her writing. 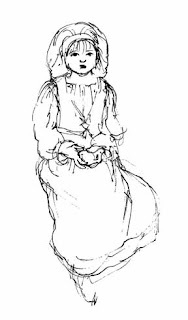 I‘ve always found it an interesting aspect of Jane Eyre that Charlotte gave her heroine artistic ability, having her carry her sketch book around with her. And she described at great length Jane sketching the fascinating Mr. Rochester—beginning with how Jane “had traced on the paper a broad and prominent forehead and a square lower outline of visage….” She detailed the process, feature by feature. "Now for the eyes: I had left them to the last, because they required the most careful working." Throughout the book she used painterly terms, very visual descriptions and even the names of artists’ colors to help her bring the scenes of her book to life. Luckily some of Charlotte’s art has survived. I always enjoy seeing the artwork of esteemed writers who are not widely known for their visual art. There are actually quite a few! 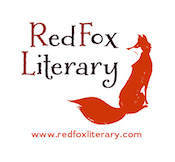 I love children’s books, from picture books to young adult, and have a wide collection—old and new and in between. I love any opportunity to celebrate their value and the enjoyment they bring! 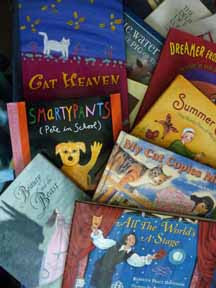 This week is National Children’s Book Week and events have been going on all across the country. Teachers, librarians, parents and publishers have been involved—not to mention authors and illustrators. The Los Angeles Public Library system scheduled events in 21 of its libraries. 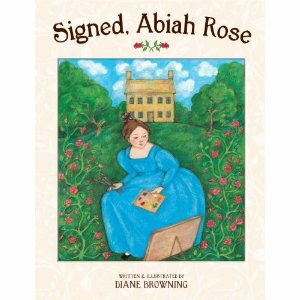 I presented Signed, Abiah Rose at the Studio City Library and had a lovely time meeting with librarians, parents, book lovers and, of course, children! Children’s Book Week has had a long tradition. A gentleman named Frederick K. Matthews—the librarian for the Boy Scouts of America—first proposed the idea in 1913. The plan to celebrate children’s books came to the attention of prominent publishers, bookstore owners and librarians and by 1919 it was celebrated all across the United States. In the 1940s the Children’s Book Council took over the responsibility for the planning and promotion of the week’s events and today Every Child a Reader is in charge. Hurray for children’s books—not just for one week but every day of the year!